Asthmanefrin™ is an over-the-counter medication for the temporary relief of bronchial asthma, including shortness of breath, tightness of chest and wheezing. Asthmanefrin™ can be administered for patients ages four (4) and older. Asthmanefrin™ is an inhaled solution delivered to the patient via a handheld device known as an atomizer. This product is not a CFC inhaler, and presents no risk to the environment. Asthmanefrin™ has been used to treat asthma in children and adults for over a hundred years. 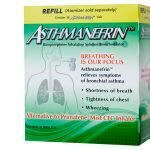 Purchase the Asthmanefrin™ Refill Kit. The refill kit contains thirty (30) vials of Asthmanefrin™.